Mornings are my enemy. I hate waking up and love sleeping in, but that just doesn’t fly anymore having kids. Starting your morning off on the right foot sets the tone for the rest of the day so I am a firm believer in making your mornings go as smoothly as possible. 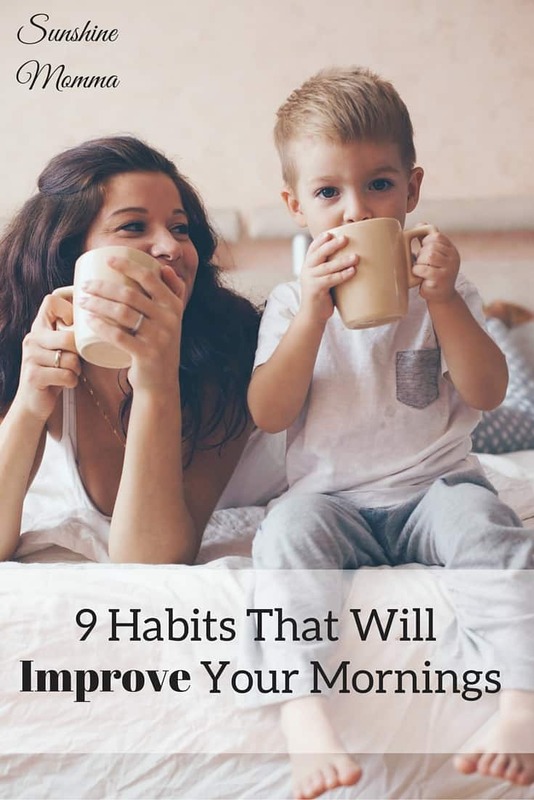 These 9 habits will improve the quality of your day and make you a better wife and mother for your family. I know this won’t apply to everyone, but in my world if I don’t have my coffee in the morning I am clearly dragging through the rest of the day. Get a coffee maker (this is the one we have and it is AMAZING!) that you can preset a time to begin brewing, that way you will always wake up smelling the coffee. If you don’t like coffee, find that drink that puts a little pep in your step in the morning, maybe a cup of tea or a smoothie. For most this is nearly impossible and I’m no stranger to setting early alarms specifically for pressing snooze, but I have discovered that if I actually wake up on the first alarm it is much easier to get going in the morning. While you’re in the shower turn on your upbeat music playlist. It will help improve your mood and get you motivated for the day. Let the sun wake you up every morning, even if it’s before your alarm goes off. It is nearly impossible for me to roll out of bed in a dark room. Great advice! I already do some of these but I will try the music in the morning and a to do list and see how it goes. Great reminders here. My fault would be the first alarm. Today I snoozed! Coffee, coffee, coffee. Yes! And your coffee pot looks amazing. Does the drip pot keep the coffee super hot? Yes it does, I love it! It has an auto shut off, but it isn’t for hours later. I really love the auto shut off because I would forget to turn it off. All such great advice! I firmly believe in investing in a good coffee maker and good coffee if you’re not a morning person. Even just that little bit of extra indulgence will make your morning more upbeat! Also, drink a big glass of water! It’s the first thing I do every morning (like, before my feet touch the floor); this isn’t just a great way to rouse yourself, but also really good for you! Creating a routine is SO key!! I love mornings. Sometimes it’s harder to get up sooner than later, but I still am a morning person. I scheduled this to tweet it later! Great post! Thank you! I love mornings (after my coffee), but I also love sleeping in occasionally so I try and keep a good balance between the two. I am a morning person so I love all these. Love the coffee heart image, so cute! Thank you! I love mornings too! These are all great tips! I think music and workout/stretching is the best for me! Thanks for sharing!! Eating a great breakfast always makes my day 10 times better! Thanks for sharing these other tips, I’ll have to try them! I could not agree more with all of these habits! Especially having the coffee set to a timer to brew first thing in the morning. I love coming downstairs to a fresh, hot pot of coffee. Also, a huge yes to stretching. It makes me feel so much better and less stiff! The morning is just that much better if it is already waiting for you! Great tips. I really need to get better about getting up on the first alarm. I used to keep my curtains open too but haven’t recently. That does help though. It makes it a lot harder to ignore your alarm when the sunlight is streaming in. We live in a very small, safe town so that helps. Great tips! I wish I could wake up to my first alarm! Coffee is always a big help though 😉 I always find I’m better prepared when I’ve made a to-do list ahead of time and am ready to sit down and start working on it as soon as I sit down at my desk. Maybe I will try this instead of waiting until morning! Thanks for the tip! So many good tips here! The two that are big for me are having the blinds open and waking up on the first (okay, maybe the second) alarm. Not letting myself fall back asleep is a great way to start the day, that’s for sure! Oh yes, that’s for sure! I have one, but I find waking up earlier than her helps! I love waking up to the sun! Some days the waking up happens prior to the sunrise though which is such a bummer! 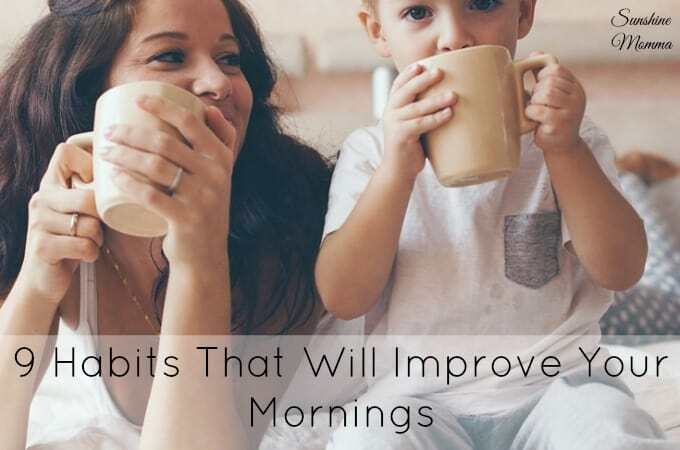 Back then, I used to ignore some of these advices, such as not getting up at the first alarm and eating breakfast; When I attended college and go to work, these are definitely great habits to start off my morning fresh! I actually don’t stretch in the morning, but I should try that! It took me a long time to get on these habits, but I love them now! Loved your tips for a happier morning! I always wake up in a rush and on-the-go that I end up feeling anxious most of the day. Waking up to the smell of coffee is a great idea, definitely need to invest in a coffee maker with a timer (and strong fresh beans hah!). It will make such a huge difference in your mood if you give yourself enough time rather than rushing. I used to be the same way and it was always such a terrible way to start my day. Love playing music in the morning! I’m not so sure my apartment neighbors love it, but I haven’t gotten any complaints yet! Love the thought of stretching while jamming to some music! It gets me motivated in the mornings! I always sleep with the curtains open, although the dark mornings don’t help at the moment! It just makes me want to sleep for longer!